The Albuquerque Police Department Continues to Expand Access through Online Communication. 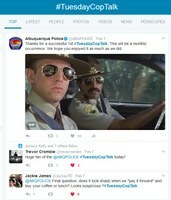 The Albuquerque Police Department will host its 2nd ever #TuesdayCopTalk on through social media on Twitter. During the first Tuesday of each month, members of the department will answer questions and listen to the community’s concerns live on Twitter. You can Tweet the department your own questions, or follow along with the conversation, by using the hashtag #TuesdayCopTalk. APD’s Twitter handle is @ABQPOLICE. 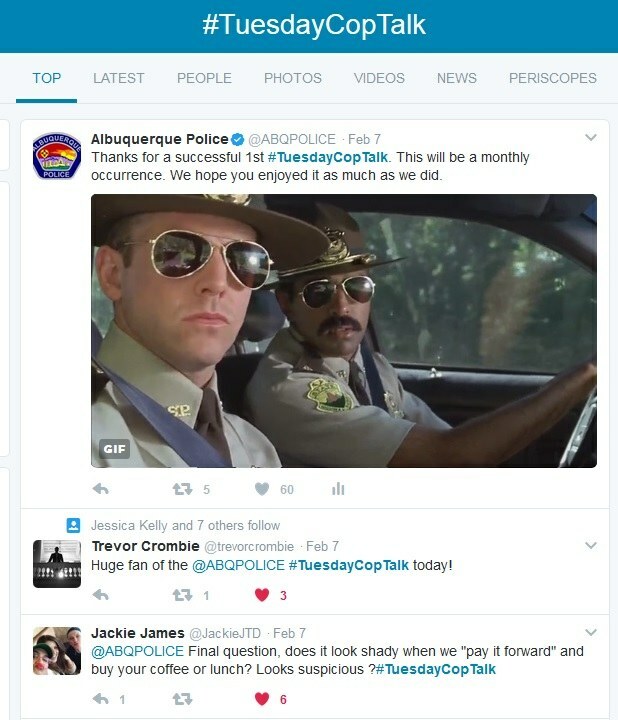 The Department’s Twitter feed is also available for non-Twitter users on APD’s website: www.cabq.gov/police where anyone can view the conversation as it happens. To further communication with the public, APD has opened its messaging functions on both Facebook and Twitter and is receiving approximately 250 direct messages via social media each month. Messages vary from tips reporting the whereabouts of wanted subjects, to possible criminal activity, inquiries concerning certain APD tactics and even kudos. During the first ever #TuesdayCopTalk hosted in February, the department answered questions concerning staffing, how to apply for APD, property crime, repeat offenders, vehicle warm-up thefts and even what types of donuts officers like best. Everyone is welcome to get involved in the conversation or follow along. We’re looking forward to another successful event.